I have almost 7 month old twin girls who are extremely picky eaters. They are exclusively breastfed but I'm worried about them getting enough iron because they will not eat green veggies. I've been introducing veggies since they were 4 month olds with little luck.. They will eat a decent amount of sweet potatoes and prunes. They continuously refuse rice cereal, oatmeal (plain or mixed with fruit purée) and all green veggies. I most concerned about iron intake. Should I be concerned? Do they need an iron supplement? About five years ago, a research study found that breastfed children between four to six months reached their lowest serum iron levels. After reviewing this study, the American Academy of Pediatrics (AAP) began to recommend that all breastfed four to six-month-olds should be given a multivitamin with iron until iron containing foods are initiated. I look at this study as not “when to start vitamins,” but “when to start solid foods”. I would much rather feed my baby naturally grown spinach than a manmade vitamin. I recommend all my patients breast or formula fed start solid foods between four to six months. I encourage my breastfed patients to start with iron containing foods. Iron deficiency is a concern for all children, the AAP also recommends a hemoglobin level between 9 to 12 months to screen children for iron deficiency anemia. In our office, we do a finger prink complete blood count or CBC (which includes a hemoglobin) at 9 month check ups. Ask the twin’s doctor about this test. 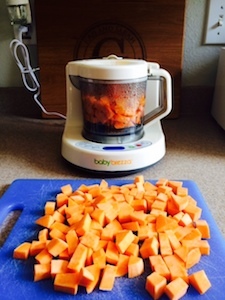 Interesting, both the two solid foods (prunes and sweet potatoes) they like contain some iron. At 7 months, children should get 11mg of iron per day. You may need to read some label and do some rough calculations. Even without solids, I doubt your twins truly “need” iron supplementation as your breast milk should provide their required nutrients. If they are not getting a good portion of their daily iron need from their solid food than I would recommend a multivitamin with iron. Unfortunately, everyone’s breast milk is different and the consequences of being iron deficient can be significant. Severe iron deficiency is shown to cause permanent cognitive problems. To be safe, I would recommend you start your girls on an iron supplement, until they are eating more iron-rich solid foods. Continue to serve them green veggies or iron fortified cereals every day. Try alternating between a food they do like and a green veggie - meaning give them a spoonful of sweet potatoes followed by a spoonful of green beans.